Female hormones have been referred to as an orchestra. When all the performers are playing their instrument in tune and on cue, a beautiful symphony of sounds results. But if one violinist is playing two counts behind, it throws off the entire group. It’s the same with hormones. Hormones communicate and influence each other. So if one is out of balance, it sets off the others as well. 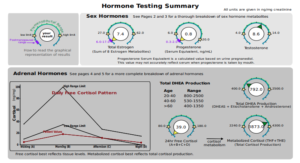 Luckily, we have several tests that can identify which hormones are out of balance and from there it’s a straightforward plan to correct course. 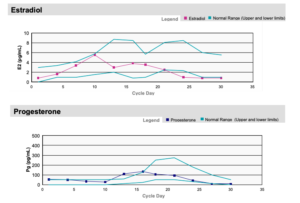 There are 3 ways we can measure hormones. Each of these three sampling methods gives us slightly different information. If you choose to work with me I will advise you which test method is best, based on your chief concerns and your health goals. Here are some test results samples (not exhaustive – just a sneak peak because I geek out about this stuff)!